Just hearing the two words “Game 6” bring back the memories of the greatest game in St. Louis Cardinals history and, arguably, the best World Series game ever. And it happened five years ago tonight, Oct. 27, 2011. How to commemorate the milestone of this event, when so much has been said and written already throughout the five years here and elsewhere? In pictures that let you relive the experience for yourself and remember how the game unfolded, as it truly spanned the gamut of baseball emotions. For a more retrospective look, this piece by Anna McDonald at ESPN from earlier this month looks at both the Rangers and Cardinals recollections from Games 6 and 7. And now, a look back to the entirety of the game, and not just the iconic moments that are still so vivid today. Jaime Garcia was the starter for the Cardinals in Game 6, and his first inning was rather rough: a walk and two singles that put the Rangers up 1-0 before he even got the first out. Maybe, like so many of us, Mother Nature was a Chris Carpenter fan. 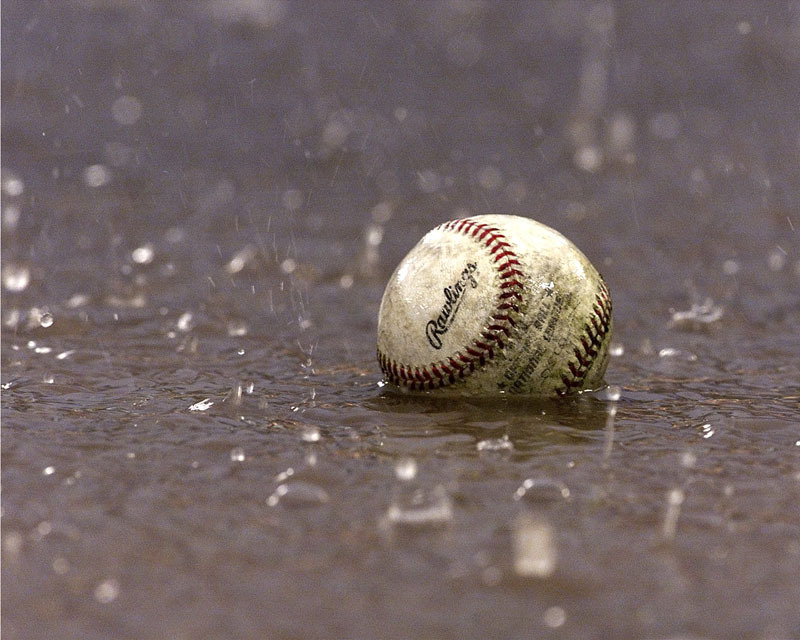 That’s one plausible explanation for the events of Oct. 26, 2011, when Game 6 of the World Series was postponed at 2 p.m. Central Time based on the St. Louis forecast for the evening — not the weather at the time. Cardinals manager Tony La Russa continues to avoid naming a starter for a potential Game 7, but definitely left the door open for Chris Carpenter to pitch that game on three days’ rest … “I was told by ‘Carp’ that he would be ready to go,” La Russa said. “I think most important is for us to concentrate [on Game] 6. Oh, right … Game 6 and all its agony and ecstasy was still to come. Another day of waiting around means another day of digesting the Cardinals’ grotesque bungling of Game 5 — which, aside from La Russa’s much-dissected bullpen-phone escapades, also drew pointed questions about the fact Pujols has the authorization from La Russa to call hit-and-run plays on his own from the batter’s box. Want to relive more of the Game 5 madness? It’s easier to take now, for sure. Here’s the recap. Thankfully, the phone craziness and the “what will Albert do?” frenzy is mostly forgotten about and the final two games of the 2011 World Series are what we recall now. But none of that would have happened without the rainout-that-really-wasn’t from five years ago tonight. Certain images immediately come to mind when thinking back to October 2011 and the road to the St. Louis Cardinals 11th World Series championship. The squirrel dashing near home plate in Game Four of the NLDS against the Philadelphia Phillies. Chris Carpenter’s primal scream at the end of Game Five. 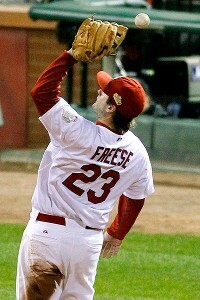 David Freese spiking his batting helmet as he ran toward home plate in Game Six of the World Series. Lance Berkman raising the World Series trophy. And, when recalling Game One of the World Series, there is this. 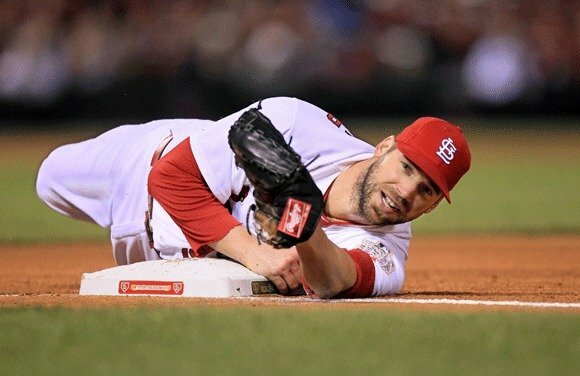 Yes, Chris Carpenter’s dive toward first base in the first inning to retrieve the throw by Albert Pujols (oops … I mean That Guy Who Used to Play First Base) after he fielded a grounder by Elvis Andrus. The play, and the Game One win, was five years ago tonight. Knowing now, of course, how the entire Series plays out it’s very interesting to read again about Nelson Cruz missing a catch that allowed a crucial run to score on a play involving David Freese. (Foreshadowing!) So relive the memories — especially of how cool it was for Octavio Dotel and Arthur Rhodes to each finally pitch in a World Series game. They are forgotten, bit-part heroes of that incredible October five years ago. 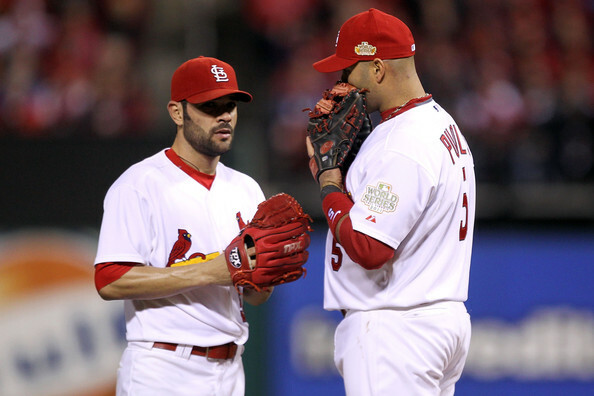 It’s been a total team effort that’s gotten the St. Louis Cardinals to the World Series. So it’s not a surprise that their 3-2 victory over the Texas Rangers in game one was a result of contributions by many. Starting pitching, relief pitching, great defense, timely hitting — each played a role in the win. Note: As I said last week, I’m not planning on writing much here anymore. But today I’m posting an article I wrote for the United Cardinal Bloggers 2013 season in review publication, which is still available for purchase. Like last week’s from the 2012 UCB publication, it’s also on Chris Carpenter. It can’t be how he expected his career to end. The final pitch of Chris Carpenter’s career came on Oct. 4, 2013, fittingly on the Busch Stadium pitcher’s mound. Fall sunshine bathed the ballpark with a golden glow as more than 40,000 Cardinals fans stood and cheered. Unfortunately, that final pitch was of no consequence. His last was a ceremonial one delivered just before Game Two of the National League Division Series between the Cardinals and Pittsburgh Pirates. 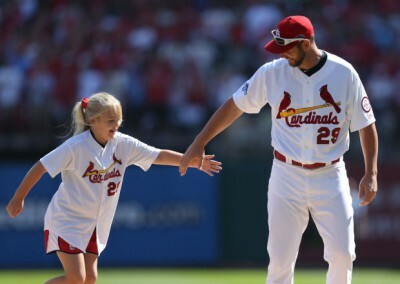 Touchingly, he was accompanied to the mound by his daughter, Ava, and tossed the baseball to his son, Sam, behind home plate. Perhaps surprisingly, the emotion of the moment was visible on Carpenter’s face as he tipped his Cardinals cap to the crowd and, moments later, embraced his children as they all walked off the mound. Then again, emotion from Chris Carpenter on a pitcher’s mound – though of a different sort – was never a surprise. It was expected. 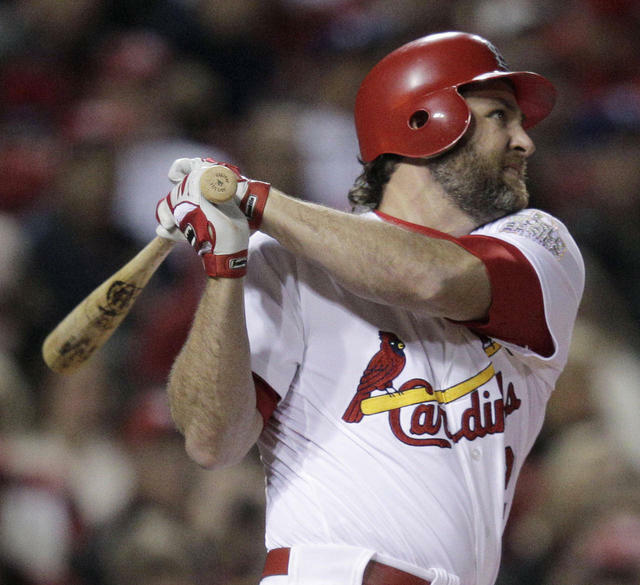 Emotion defined Chris Carpenter’s career nearly as much as his signature curveball. And nearly as much as injuries. Injury definitely defined the final two years of Carpenter’s career, 2012 and 2013. Yet it also defined how he became a Cardinal, when the Toronto Blue Jays – the team that chose him in the first round of the 1993 draft – removed him from their 40-man roster after the 2002 season ended, and after he’d had shoulder surgery. The Jays wanted him to sign a minor-league contract with incentives. He instead chose to become a free agent, signing with St. Louis in December. 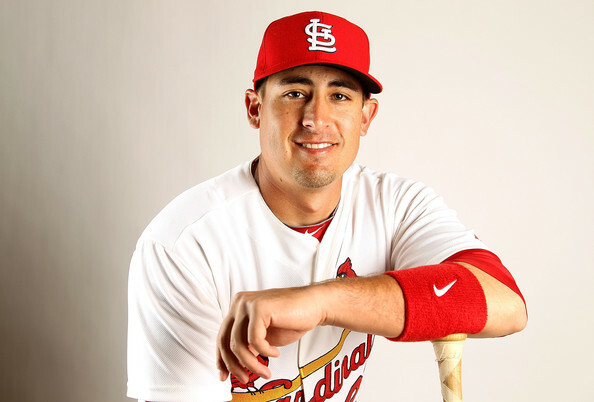 He missed the entire 2003 season, finally making his Cardinals debut on April 9, 2004, at Arizona. His 2004 season was better than any he’d ever had as a Blue Jay, as he went 15-5 with a 3.46 ERA. But he didn’t pitch after Sept. 18, as a right biceps strain kept him from the mound. Tests later revealed a nerve irritation to his upper arm, a condition we would become all too familiar with in the future. Like many of you, I watched yesterday’s NFC championship game between the Green Bay Packers and Seattle Seahawks. Unlike most of you, I am the rare combination of St. Louis Cardinals fan for baseball and Chicago Bears fan for football. 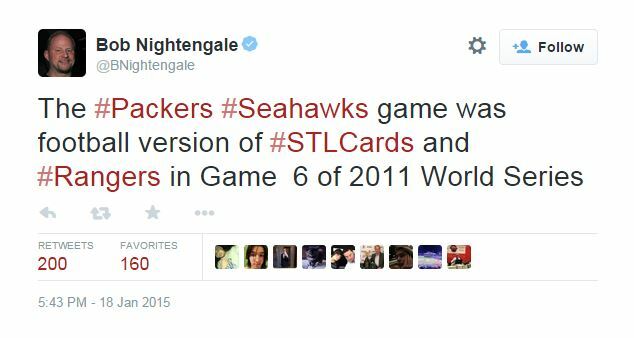 Which means I wasn’t rooting for the Packers — I know there are quite a few Cardinals/Packers fans (I am related to several) who obviously were rooting for their team, and the Cardinals/Rams fans were for the Packers also rather than see a division rival win. So, personally, I was ecstatic over the outcome. More than ecstatic, actually, to see the Packers implode that way. But I definitely disagree with Bob Nightengale. 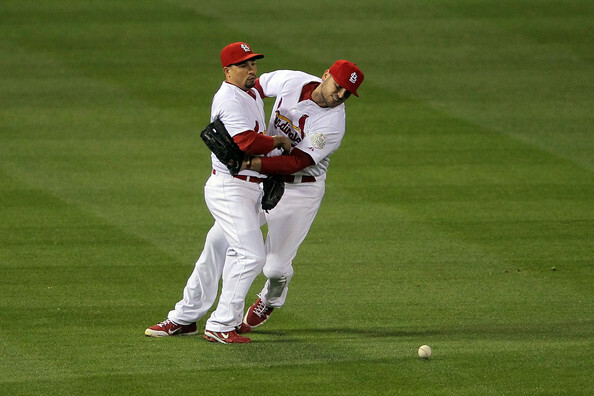 Sure, I get it — sloppy game to start with, as we remember the ball that bounced off David Freese or the one that neither Matt Holliday nor Rafael Furcal could come up with in Game 6. Yes, comparisons can be made with the four interceptions that Russell Wilson threw yesterday. 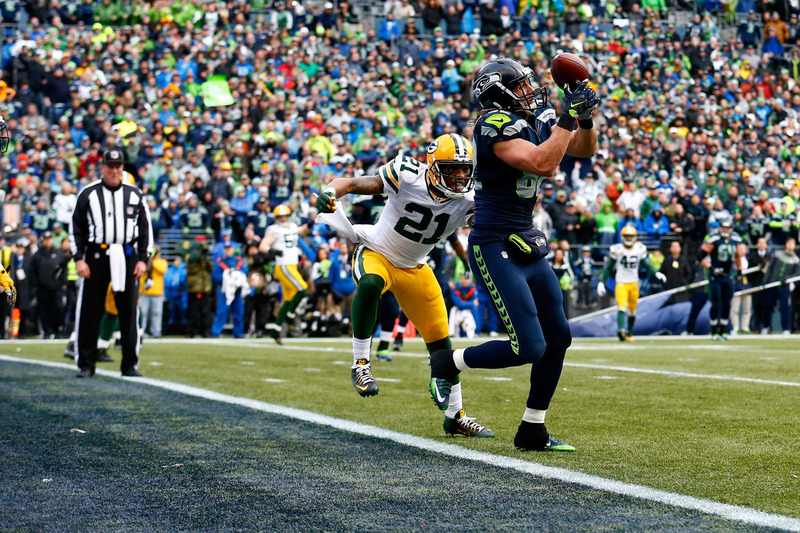 The comeback that Wilson led, with the Seahawks scoring 15 points late in the fourth quarter was definitely amazing. Incredible plays, like Seattle recovering the onside kick after Wilson scored a touchdown with just over two minutes left. Then the two-point conversion pictured above. We even had the moment similar to Josh Hamilton’s Game 6 10th inning homer — kind of — in Mason Crosby’s game-tying field goal with just 14 seconds left to send the game to overtime. Three years ago, the Cardinals began today with a record of 67-63 after being swept by the National League West’s fourth place Dodgers. The Cards were second in the National League Central to the Brewers, 10 games back, and third in the wild card standings, 10.5 games behind the Braves and one game behind the Giants. We know what happened from there, of course. We’ll never tire of recalling how the Cardinals went 23-9 from Aug. 25 through the final day of the regular season on Sept. 28, when Chris Carpenter and Company beat the Astros 8-0 for a historic comeback to win the wild card. As those games — and wins — went by, we marveled at the contributions from The Shredder and The Riot and Freeser and even Carlos Marmol and his walk-off wild pitch in addition to the season-long contributions from Lance Berkman, Matt Holliday, Yadi and That Guy Who Used To Play First Base. Yet one thing seems to be forgotten in all our giddiness and our magical memories of Happy Flights and reaching October and the incredible ride that culminated in glorious World Championship No. 11 in ’11. It’s so easy to forget the absolutely vital role the Braves played in making it all possible for the Cardinals. The Cardinals Last Walk-Off Homer Was When? As yesterday’s game went into extra innings (and perhaps the less said about the game, the better — another frustrating loss in a season filled with them), the thoughts of Cardinals fans turned to walk-off wins. The 2014 Cardinals have had two so far, both within the past two weeks and both decided in odd ways: the walk-off hit-by-pitch against the Cubs on May 13 and last week’s walk-off throwing error by the Diamondbacks in extra innings. In the end, wins are wins and however they are achieved works. But when was the last time we experienced the joy and thrill of a walk-off home run, that unbelievable feeling like in Game Six of the 2011 World Series? Wow. And nearly three years now since the last regular season walk-off homer. Want To Win A 2011 World Series Game 6 DVD? Baseball is so much about history, which we as St. Louis Cardinals fans especially know. There are so many classic games the Cardinals have been involved in through the decades, and even (or especially) recently. 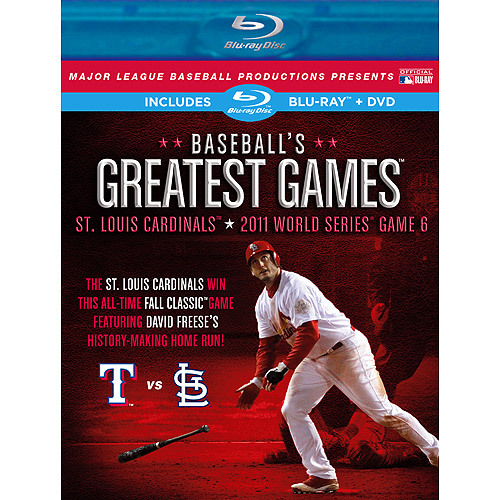 To celebrate some of the greatest moments in overall MLB history being available for digital download on iTunes, you have the chance to win the most memorable Cardinals game in recent years on DVD/Bluray combo: Game Six of the 2011 World Series. It’s part of A&E Home Video’s “Baseball’s Greatest Games” series, and it couldn’t be easier to enter our drawing to win one of three DVDs. Simply provide the answer in a comment below, tweet @AMilesFastball or leave it as a comment on the AMF Facebook page. Enter by this Tuesday, April 15, at 7 p.m. Central Time (just before the Cardinals-Brewers game). A random drawing for the winners will be held.